We are very much honoured to have Professor Christopher Chen Li-Hsian, a Senior Clinician-Scientist, Associate Professor at the Departments of Pharmacology and Psychological Medicine, Yong Loo Lin School of Medicine, National University of Singapore, and Director of the Memory Aging and Cognition Centre, National University Healthcare System, to visit our Department on 13th November 2018. A tour of CUHK Eye Centre, CUHK Ophthalmic Research Centre and Hong Kong Eye Hospital was guided by our Assistant Professor Dr. Waikit Chu. Professor Chen gave a lecture on “Advances in Diagnostic Criteria for Alzheimer’s Disease: the Role of Brain and Retinal Imaging”. Further research collaboration between CUHK DOVS and the Memory Aging and Cognition Centre, Singapore, was being discussed during the visit. We very much look forward to working with Professor Chen and his team on our collaborative projects. 4/F, Hong Kong Eye Hospital, 147K Argyle Street, KLN., Hong Kong. 3/F, Hong Kong Eye Hospital, 147K Argyle Street, KLN., Hong Kong. Copyright © 2019. All Rights Reserved. Department of Ophthalmology and Visual Sciences. Faculty of Medicine, The Chinese University of Hong Kong. 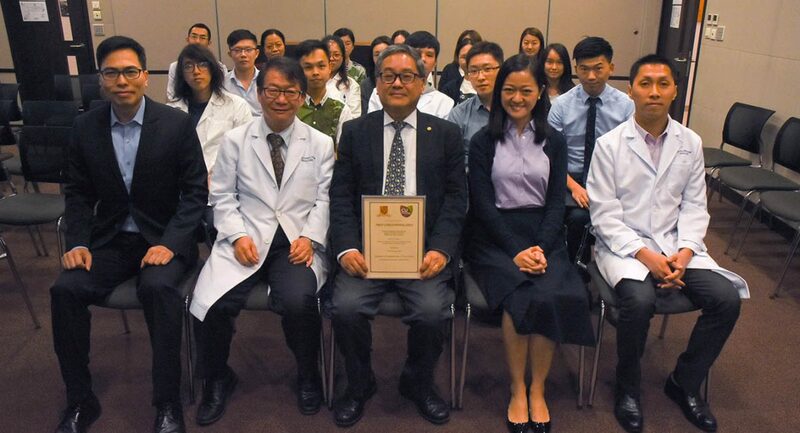 We are very much honoured to have <strong><a href="http://nusmedicine.nus.edu.sg/pcm/faculty-staff/expert-team-physicians-psychologist/christopher-chen-li-hsian/">Professor Christopher Chen Li-Hsian</a></strong>, a Senior Clinician-Scientist, Associate Professor at the Departments of Pharmacology and Psychological Medicine, <a href="https://nusmedicine.nus.edu.sg/admissions"><strong>Yong Loo Lin School of Medicine, National University of Singapore</strong></a>, and Director of the Memory Aging and Cognition Centre, National University Healthcare System, to visit our Department on 13th November 2018. A tour of CUHK Eye Centre, CUHK Ophthalmic Research Centre and Hong Kong Eye Hospital was guided by our Assistant Professor Dr. Waikit Chu. Professor Chen gave a lecture on “Advances in Diagnostic Criteria for Alzheimer's Disease: the Role of Brain and Retinal Imaging”. Further research collaboration between CUHK DOVS and the Memory Aging and Cognition Centre, Singapore, was being discussed during the visit. We very much look forward to working with Professor Chen and his team on our collaborative projects.